EUROPE: The Carbon Trust has launched a new phase of its Offshore Wind Accelerator (OWA) programme, with nine developers investing £6.4 million (€7.5 million). Developers Dong Energy, EnBW, E.on, Iberdrola, RWE, SSE, Statkraft, Statoil and Vattenfall have all signed up to the programme. 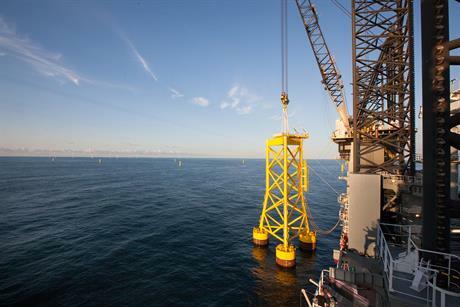 They will invest in research, development and demonstration projects over the net four years to help ensure that offshore costs fall to below €100/MWh and meet the new objective of €80/MWh by 2025, set at the start of June. The industry is currently buoyed by Dong Energy's €72.70/MWh winning bid – excluding €14/MWh connection costs – to develop the 700MW Borssele projects in the Netherlands. Carbon Trust CEO Tom Delay said: "Over the last five years the cost of energy from offshore wind has decreased significantly, largely driven by a combination of innovation, risk reduction and increased deployment rates. But we need to continue building on this success by getting the right solutions into market quickly to put offshore wind on the path to cost competitiveness by 2020." The new investment follows the £1.5 million the Scottish government pledged to the scheme last month. German developer EnBW has joined the programme, replacing Mainstream Renewable Power, which was one of the nine companies in the previous phase. The Irish-based firm is said to plan its exit from the offshore sector. And Iberdrola has replaced its UK subsidiary ScottishPower Renewables in the group. Since it was set up in 2008, the OWA has also supported the development of floating lidar technologies, 66kW cables, lightweight monopiles and suction-bucket foundations for projects in the UK and Europe.